This outstanding dramatization from Focus on the Family presents the life of one of Christendom’s greatest thinkers. As a young man, Dietrich Bonhoeffer felt a call to the ministry and determined to follow it no matter where it would lead. And it led him to places and situations that challenged every aspect of his faith--and demanded everything from him. 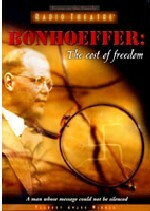 Wrestling with the absolute of truth, the infallibility of Scripture and the Third Reich’s oppression of Jews and the German church, Bonhoeffer desired to remain loyal to his homeland yet refused to take part in its evil. He was rejected by both his government and the church and eventually arrested for treason. So, how do you conquer the evils that pervade the popular culture? Is it possible to erase the hatred and prejudices that keep us divided and threaten our liberty? Listeners will be challenged to draw their own conclusions of the issue of what it truly means to be free. An excellent addition to your study of the World War II period.